Tremendous grooves from the earliest (and best) years of the acid jazz scene – all recorded at a time when London was exploding with sounds from the 60s and 70s, and turning out some of the hippest music on the planet! 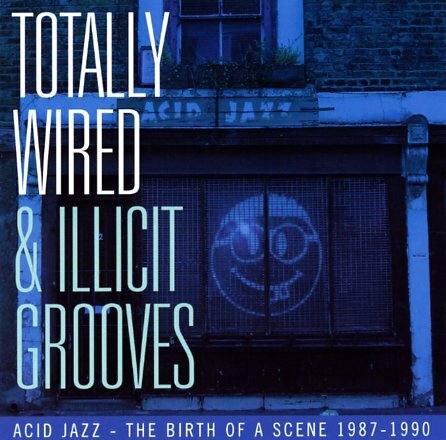 Although the term "acid jazz" was soon mishandled and mis-managed here in the US, the earliest days of the movement were really a tremendous time in London – a period when folks returned to the core elements that made funk, jazz, and soul great – and shook off all of the too-electric and too-stiff modes that had crept in during the 80s! Most of the work here is in a really spare, stripped-down funky mode – a cross between soul jazz of the 60s and blacksploitation funk of the 70s, with possibly a few more contemporary elements thrown into the mix. And in these years way before the current deep funk revival, what's even more important is the way these songs were produced – with a warmth that other groups hadn't had in years, and a real love of the way these tracks might have sounded in older studios a few decades before. The package contains a number of key rare singles from the Acid Jazz label, other album tracks, and even a few classics that had a big influence on the London scene. Titles include the rare pre-Acid Jazz single "Got To Give" by The Brand New Heavies, the sublime "Rejoice In Righteousness" by Bukky Leo Quintet, and the tracks "Cut & Run" by Lay Zee Muthas, "Like A Gun" by King Truman, "The Killer" by Night Trains, "People Get Ready" by The Brand New Heavies, "Haw Right Now" by Patrice Rushen, "Earthly Powers" by Man Called Adam, "Mr PC" by Snowboy, "Spinning Wheel" by New Jersey Kings, "Let The Good Times Roll" by The Quiet Boys, and "Mighty Mouse" by Caesar Frazier. Loads of great notes too – a really detailed look at the London scene at the end of the 80s! © 1996-2019, Dusty Groove, Inc.